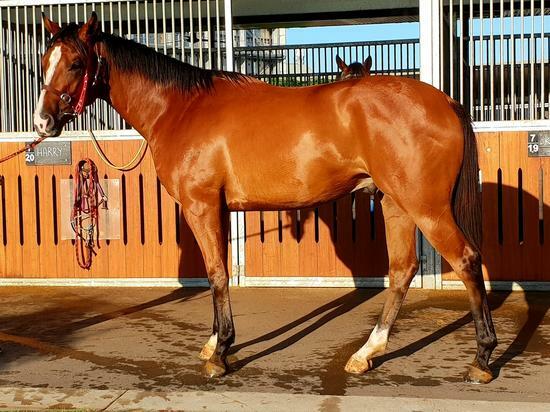 MAHISARA (AUS) (Bay 2008-Stud 2014). 7 wins-3 at 2-to 1500m, MRC Sandown S., Gr.3-twice, Qld Tatt's RC Australia Post S., L. Brother to SP Braccenby. Sire of Miss Sara, Let's Go Bobby, Mahis Angel, Hallside Fandango, Lady Yendor, Lollipop Rocket, Astral Knight, Mishani Courage, Apache Belle, Mishani Krishna, Taraki, Vibrant Thunder and of the placegetters Arte et Marte, Child Support, Crude Oil, Grand Alibi, Groovy Playmate, Let Sara Rock, etc. His oldest progeny are 3YOs. HIDDEN STARLET, by Hidden Dragon. 2 wins at 800m, 850m in Aust. Dam of two foals, neither raced. Dragoneight. 2 wins-1 at 2-at 1000m, 1250m to 2017-18 in Aust. Hidden Starlet. 2 wins. See above. Brain Teaser. Placed at 3 in Aust. Age of Heroes (Grandera). 7 wins to 1500m, A$221,900, BTC Hidden Dragons' at Magic Millions H., QTC Subiaco Hair H., BRC Height 4 Hire H., Padua College H., Iguana Ink H., QTC Riccarton H., 2d Qld Tatt's RC Tattersall's Arcade H., BRC Style Magazines H., XXXX H., QTC Champagne Bar P., 3d BRC Members' H., L, Hyundai H., Woolworths P., XXXX Gold H.
Shaos. 5 wins-1 at 2-from 1000m to 1900m, BRC Simon George P.
Steadfast Warrior. 5 wins from 1200m to 2200m, S$361,538, Singapore TC Class 4 H.-twice, Top Spin H., Hello England S., Class 3 H., 2d Singapore TC Open H., Initiation P.-twice, Kranji C S.-twice, Kindness S., Singapore Airlines A380 Paris S., 3d Singapore TC Sha Tin H., Open H.
St Lor. 6 wins-2 at 2-to 1250m in Aust. Vinci Lady. Winner at 1000m in 2018-19 in Aust. Casa del Fuego. Winner at 2100m in Aust. You See a Star. Winner. See above. Lady Whispers. 10 wins-1 at 2-from 1400m to 2100m, A$177,350, QTC Ngawyni H., Claret 2YO H., Anchor In H., BATC Smokey Eyes H., Power's Light H., 2d QTC Winter Sponsors H., Ayr H., 3d QTC BR Cyprian H., Athol Mulley H., Sandown H., BATC Gunsynd Garden H., 4th Townsville Cup, L. Producer. Il Centro Star. 6 wins to 1400m, BTC Carlton United H., 3d BTC Rush H. Producer. Crystal Moss. 8 wins to 1200m, A$78,725, 3d BTC Sky Channel H.
Castle Express. 12 wins-1 at 2-from 1200m to 2000m, A$275,050, BRC Racing Queensland National Apprentices Series P., Hardy Brothers Brisbane Bloodstock Bonus 2YO P., 2d BRC Brc.com.au H., 3d BRC All Cool Industries H., Townsville Cup, BRC Stanton Mienert Accountants H., Best Security H., Sequalo at Lyndhurst Stud H., Channel Seven H., Hidden Dragon at Lyndhurst Stud P., Neil McLeod P., Mackay Cup. Spring Dance. 4 wins-1 at 2-to 1500m, SAJC Landsighting H., 2d BTC Black Toyota Warwick H., Glenlogan Park H., 3d BTC B Glover 2YO H.
Sunset Plains. 2 wins at 1500m, 1650m, QTC Lord Rego H., BATC Dead Rat Hotel H., 3d QTC Rocklea H.
Semisprings. 3 wins. See above. Whispering Spring (Marceau). Winner. See above. Star of Fantasy - American Lettuce (H.K.). 5 wins to 1400m in Aust. and HK, BATC Bletchingly H.
Zentessa (Zed). 3 wins at 1200m, 1600m to 2018-19, CJC Zacinto at Valachi Downs H., 2d CJC Spring Classic H., L.
Ferrari Spirit (Il Ferrari). 8 wins-1 at 2-to 1400m, A$79,849, WATC Mighty Kingdom 2YO H., 2d WATC Ascot S., L.